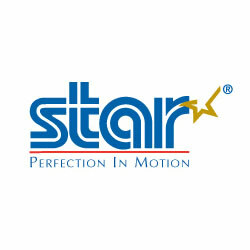 STAR’s newest model, STAR SR-20RIV is equipped with complex machining functions adaptable to multiple industries. The 27-positioned tool station can accomodate a maximum of 41 tools to allow a variety of tooling layouts. 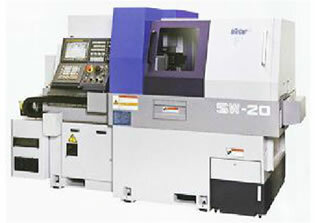 The eight-axis unit with a Y-axis control function allows various kinds of complex machining on the rear side. The machine reduces the time required for program processing. The pursuit of reduced idle times both mechanically and electrically through the latest software allow complex components to be manufactured in the fastest possible times to improve both production output & profitability. Simultaneous machining (turning + drilling, etc.) by opposing plattens lead to shortened machining time. 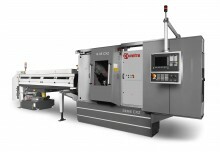 Front and back are independently controlled, which also greatly reduce machining time. Variety of new functions, such as manual handle retracing, program check, code help and others are added to help the operator. 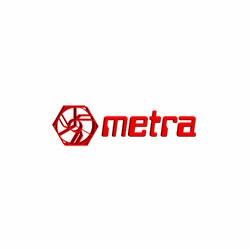 Optimum performance capability at the most cost-effective price. This economy models replace the SB-16 with larger diameter Ø 20mm and 4 spindle-cross drilling unit. Main and sub spindle are equipped with C-axis control as a standard function for broader range machining. Secondary machining capacity is improved by additional power-driven tools. Completely independent back-working! SB-20R Machine has a removable guide bushing. Economical, space saving and extraordinarily productive, the SR-10J possesses C-axis control and multifunction capabilities. Designed for small parts with its high-speed feed and full overlapping capability. Close cutting position to the guide bush provides enhanced accuracy for small parts machining. 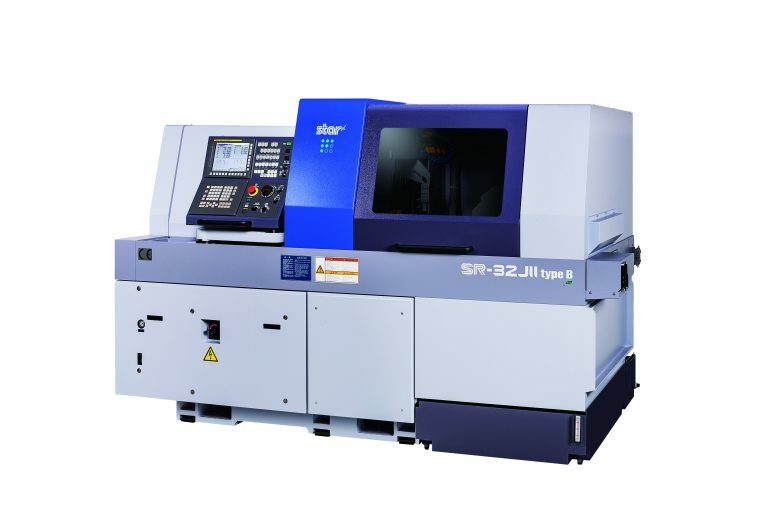 The SR-20J provides superior cost capability performance- whether you choose the Swiss Type C or Non-Guide Bush Type N. The original design achieve maximum rigidity and flexibility, as well as enhanced tooling to capitalize on basic and advanced machining applications. Faster machining time, versatile tooling and precise, powerful machining, the SV series covers every possibility of machining from small to large diameter work. 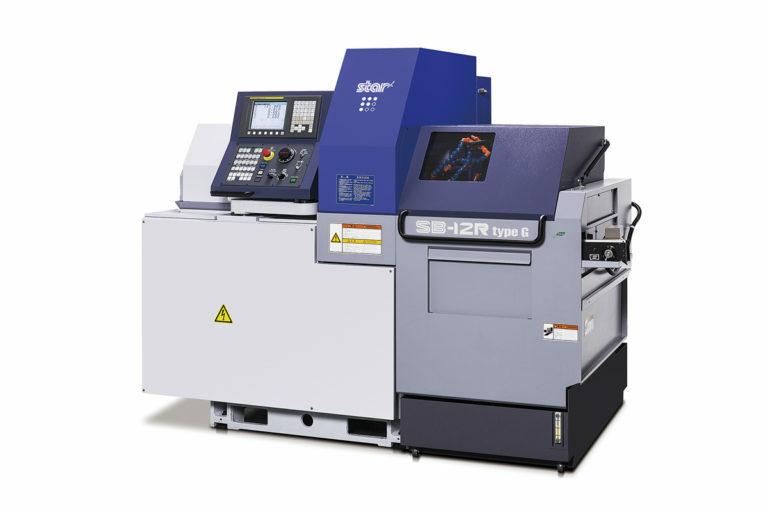 This multi-axis and multi-group control machine line is optimal for highly accurate and complex machining of small parts and difficult to cut materials with its main/sub spindle. 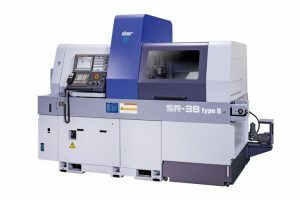 The SR-32J Type N, Non-Guide-Bush Type, is especially designed for complex machining of short work pieces. The reduction of remnant material length can dramatically change the production costs of large diameter work pieces because such costs are easily affected by material costs. The new SG-42 – Star’s first fixed head CNC Automatic Lathe – is intended for the manufacture of complex components up to 42mm diameter! The 6-axes feature C-axis on both main and counter spindles. 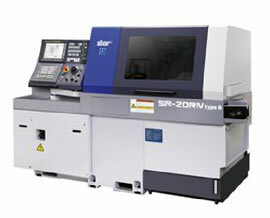 A broad range of machining variations is achieved by the turret tool post & sub spindle.